If traveling 15 times a year for the last 3 years taught me anything, it’s how to pack an organized suitcase. I used to be an over-packer that would wait until the last minute, throw everything in a bag and pray for the best. That left me with a lot of overweight baggage fees and also a huge mess to sort through when I got to my destination. Now when I travel, not only am I more organized, I can actually travel with just a carryon (shocking, I know). This saves me a lot of money and a lot of wasted time trying to find things in my luggage. I’ve even had a few friends ask me to show them how to pack their suitcases after they’ve seen how organized mine is. Below I have a few tips that make organizing a suitcase so easy and a $600 Nordstrom Gift Card Giveaway! At first I was a skeptic about the concept of rolling clothes instead of folding them. I thought it would take up more space. However, it actually saves space and helps keep your clothes wrinkle free! Always roll your lighter items (like t shirts and dresses) and fold sturdy items (like jackets or bulky denim). Packing cubes are a must for an organized suitcase! They help everything stay in place and also compress your items which gives you even more space. They also make unpacking a breeze because you can just put the cubes straight into the drawers at your hotel. My favorite packing cubes are from MY TAGALONGS. You can find them by clicking HERE. I try to avoid having to repack all of my beauty products into smaller containers. With so many beauty subscription boxes and more companies offering sample sizes, it’s easy to find travel friendly sizes of your favorites. I also like to bring one versatile makeup palette that has daytime and nighttime colors in it. As technology grows so does the number of chargers I travel with. I love the charger case and earbud case from MY TAGALONGS because they help me travel tangle free. For organized travel make sure everything has a dedicated location. 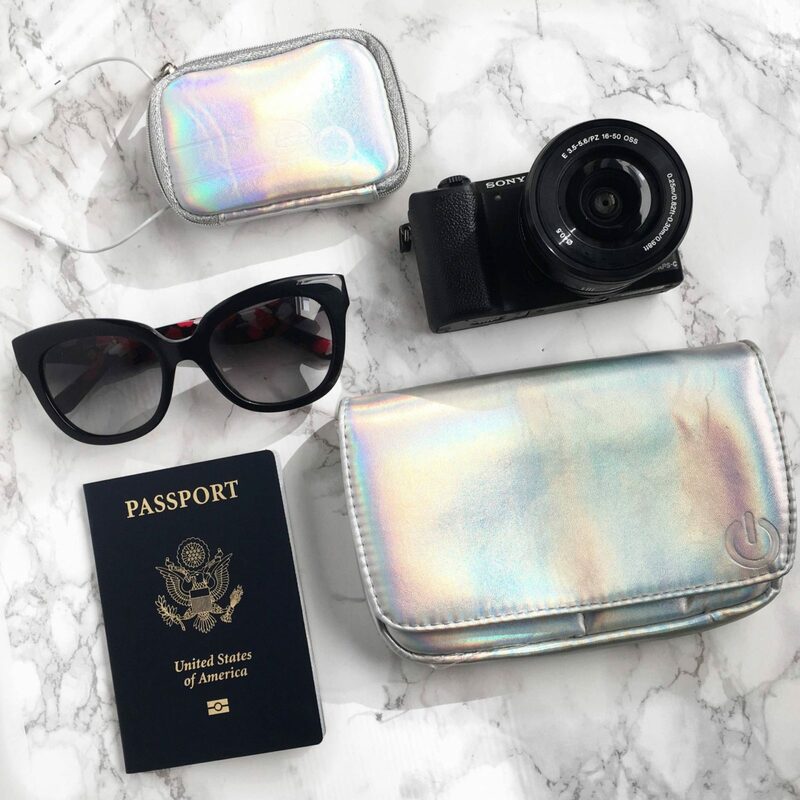 What are your chic travel tips? What is your favorite travel must-have from mytagalongs.com? Let’s chat! Leave a comment below. P.S. Looking for packing tips for a quick weekend getaway? Read my post HERE. a $600 Nordstrom Gift Card, just in time for some fall shopping! This giveaway is open internationally and runs until 9/20. I haven’t traveled at all, but I’m thinking about traveling. So this will come in handy in the future. I will diffidently bookmark it for future use. Thank you for sharing! Thanks for reading Gigi! These tips will save you a lot of time when you do travel. I have never heard of My Tagalongs, so I just had a look at their website and they have some really cute products! Thanks for sharing!